WASHINGTON -- An Iranian drone came very close to a U.S. Navy fighter jet Tuesday as it was preparing to land on a U.S. warship, CBS News national security correspondent David Martin reports. 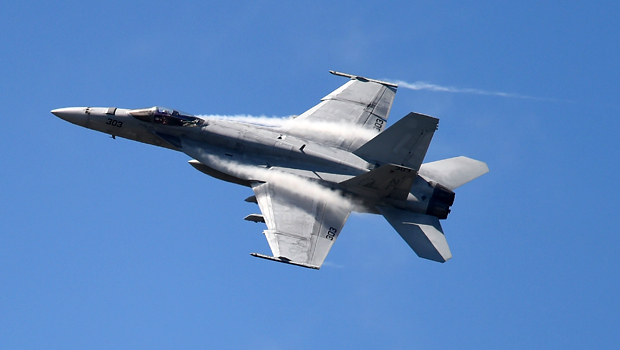 The U.S. Navy F-18 Super Hornet was in a holding pattern waiting to land on the USS Nimitz when the Iranian drone ignored repeated radio warning and came within 200 feet of the American fighter jet. They were separated by 100 feet in altitude -- close enough so that the F-18 pilot took evasive action, Martin reports. A U.S. Navy official called the interaction "unsafe and unprofessional," Martin reports. A Central Command statement said the Iranian drone's "dangerous maneuver" created a "collision hazard" and was in violation of international maritime laws. So far this year, there have been 13 unsafe and unprofessional encounters between the U.S. Navy and Iranian forces in the Persian Gulf, although most of them involve close encounters between ships, rather than aircrafts, Martin reports.